San Francisco hosts more than 25 million visitors every year which makes it one of the country’s most visited cities. And, if you spend a day or two surrounded by our city’s iconic Victorian homes, eclectic food scene and urban, artistic culture, it’s easy to find out why so many people want to be here. But the first step to any visit is deciding where to stay. If you want to be right in the heart of the city, you definitely won’t be short on options. To help you narrow them down, we rounded up the best hotels in eight different categories from the most family-friendly to the hippest and everything in between. So first, choose a hotel. Then, check out What to Do in San Francisco in One Day and decide what you’ll be doing while you’re here. Inspired by its Marina District surroundings, Hotel del Sol was recently renovated with a huge emphasis on bright color and fun. This family and pet-friendly boutique hotel offers concierge services, nighttime quiet hours, a heated pool, complimentary continental breakfast, a movie library, afternoon cookies and milk, and inexpensive, on-site parking. 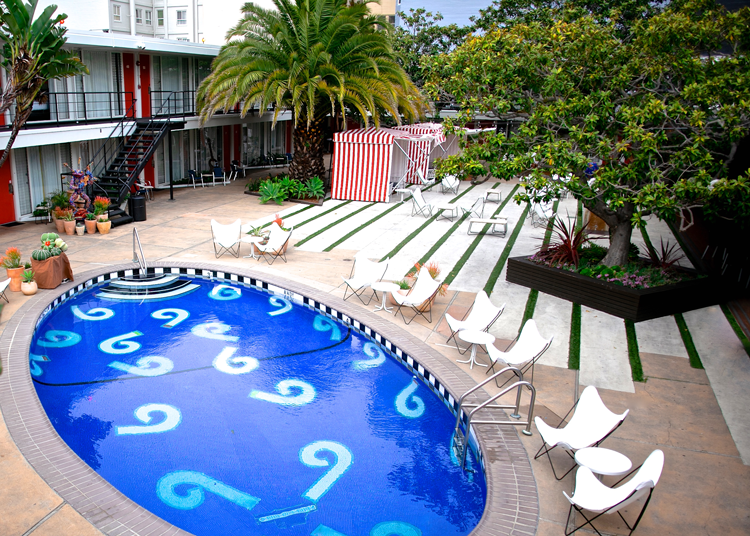 As evidenced by this list, many of San Francisco’s hotels cluster on the east side of the city, but Ocean Park Motel offers a historic escape just steps from Ocean Beach and the San Francisco Zoo. As the city’s first motel, this dog-friendly lodging has been in operation since 1937, and today, their 1930s art deco decor is perfectly suited for the trendiest of design lovers. It was even honored by the Art Deco Society in 1987 for the preservation of this Streamline Moderne beauty. Distinctive and full of San Francisco character, The Marker was originally built in 1910 in the Beaux-Arts style and was newly renovated in 2018. Inside the suites, jewel tones and bold decor make this a one-of-a-kind place to rest your head and outside the suites, you’ll find other on-site attractions like Tratto. In addition to people-friendly amenities like complimentary yoga mats and blocks and bicycle rentals, special pet amenities like treats, bowls and pet beds are available upon request. This Union Square hotel offers the very best comforts for every creature, including rentable bike cruisers, comfy robes and big fluffy towels, valet parking and afternoon treats of Equator coffee and signature pineapple cupcakes. The Pineapple Pup Package offers savings on the pet fee as well as a water bowl, treats, a dog bed and a waste bag dispenser filled with bags! Quite possibly the hippest hotel in San Francisco, Phoenix is just a stone’s throw from the Bill Graham Civic Auditorium and the Great American Music Hall, which has made it a cornerstone of the city’s storied musical past. The rock-and-roll style is complete with 1950s era decor, an open courtyard, and an origin story that starts back in 1956 and includes characters like Neil Young, Kurt Cobain and JFK Jr. Located in the city’s vibrant South of Market district, W San Francisco is a destination for tourists and locals alike when it comes to live music events, parties and happy hours. In addition to the amenities of its home neighborhood, the hotel itself offers art, panoramic views, locally-sourced cuisine, dynamic, modern design and rooms that are as colorful as our city. Already a famous destination in San Francisco, the Palace Hotel celebrates the luxury of the Gilded Age with historic architecture and world-class service. Luxurious amenities include professional concierge assistance and valet parking, in-room dining and two famous restaurants, scenic city views, a cutting-edge fitness center and a heated, indoor pool with a sky-lit ceiling. To get a feel for the Palace, we recommend enjoying Signature Tea in The Garden Court whether you’re staying overnight or not. Situated atop Nob Hill, Fairmont is one of the city’s most luxurious hotels. Its story begins just a few years before the famous earthquake and fire of 1906; it was rebuilt and restored immediately after and has since had a heavily storied past. Today, the hotel’s 606 guest rooms and suites, including the famed Penthouse Suite, have been luxuriously refurbished with marble baths and picture windows alongside modern amenities like high-speed internet. Be sure you head into Tonga Room & Hurricane Bar, the hotel’s iconic tiki bar that has its own indoor thunder and lightning storms! 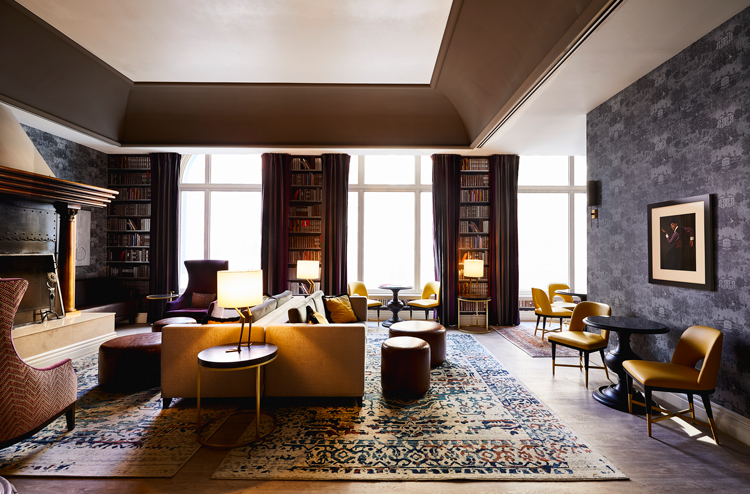 The city’s first luxury lodging to open in over a decade, Proper is housed in a historic flatiron building originally built in 1909 in the heart of Mid-Market. It perfectly combines that historic setting with modern amenities and decor inspired by the Modernist, Cubist and Secessionist eras. The pet-friendly hotel boasts three different dining destinations, including the rooftop bar and lounge Charmaine’s, as well as bikes for loan, a smoke-free environment and a 24-hour fitness center. 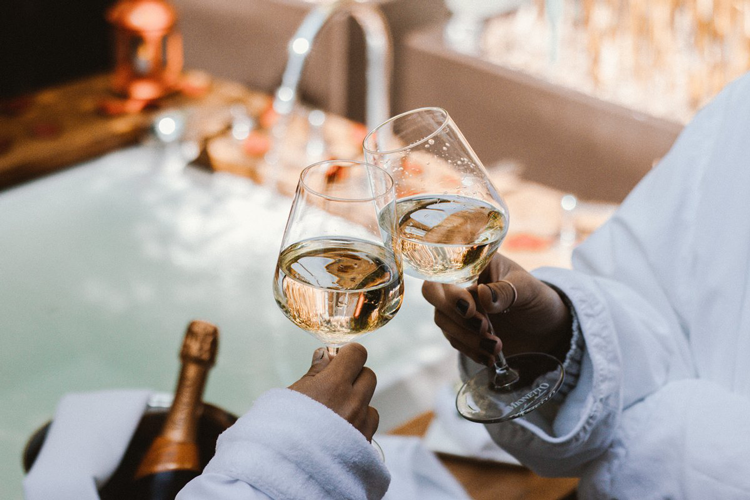 As San Francisco’s only waterfront luxury boutique hotel, Hotel Vitale offers an overnight experience you can’t get anywhere else in the city. 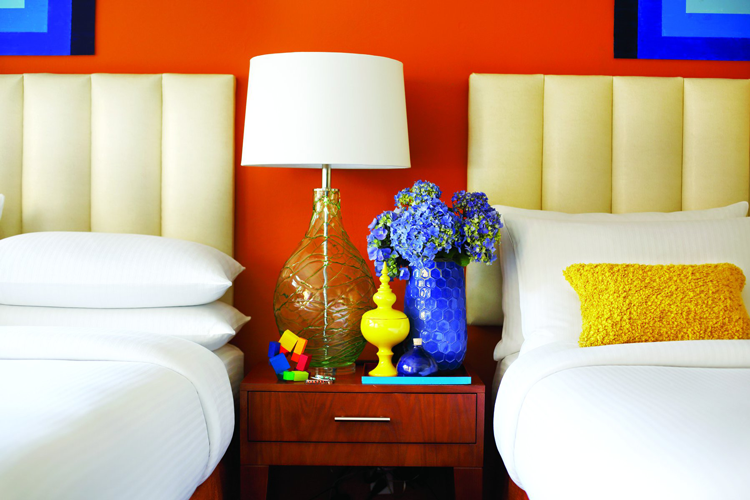 Located along the Embarcadero, it’s pet-friendly and a certified San Francisco Green Business. It’s home to Americano Restaurant & Bar and offers a penthouse level spa with rooftop soaking tubs and yoga classes! Located in Fisherman’s Wharf and inspired by Greek legend and Gold Rush-era adventurers, the iconic Argonaut is eco-friendly, pet-friendly and family-friendly in the heart of one of the city’s most visited neighborhoods. Interior design includes a heavy ocean influence alongside cozy exposed brick and dramatic views. 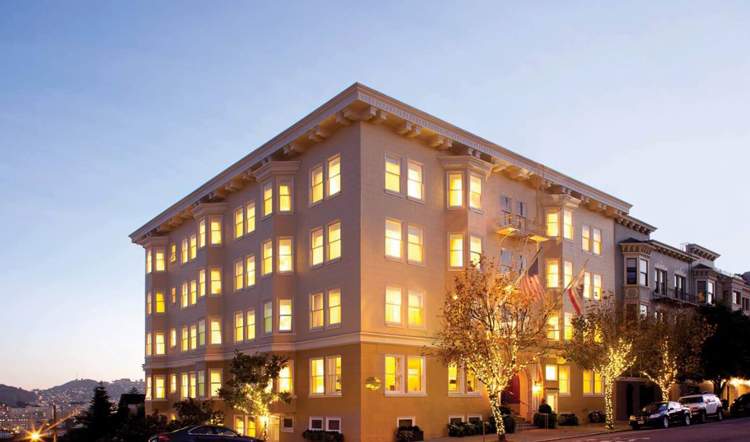 Located in what is very likely the best neighborhood for views of the Golden Gate Bridge, Inn at the Presidio is housed at Pershing Hall, a building which served as a home for bachelor officers when the Presidio was a U.S. Army post. Today, the Georgian Revival-style building has been restored as a guest lodge complete with 22 spacious accommodations, including 17 suites with fireplaces. For ideas on what to do in the Presidio, check out Your Guide to Spending a Full Day in The Presidio, Mapped. Inspired by the classic luxury hotels of the early 20th century, The Clift Royal Sonesta boasts interiors designed by French designer Philippe Starck as well as furniture by Salvador Dalí, chairs from Ray and Charles Eames, and the famous Redwood Room, an art deco restaurant lined with paneling that is said to have been carved from a single redwood tree. Be sure to snap an Instagram photo in the giant chair located in the lobby; you can’t miss it. 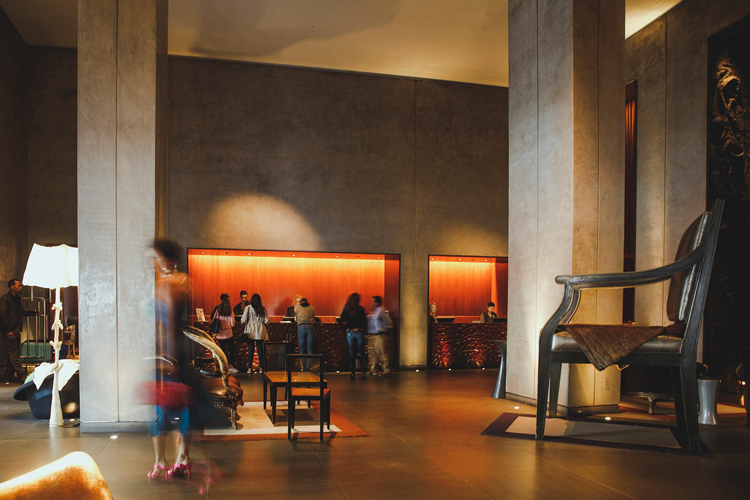 Located in the heart of SoMa, this famously luxurious hotel boasts its own jaw-dropping art, but it also adjoins the San Francisco Museum of Modern Art and is in the same building as the Museum of the African Diaspora. Amenities include valet parking, butler service, a full-service spa, pet-friendly accommodations and more. White Swan Inn is a cozy, boutique hotel that merges English countryside decor and sensibilities with modern, urban amenities. The quirky lodging offers a daily complimentary full breakfast buffet, evening wine hours by the fire with finger foods and local pours, fresh-baked afternoon cookies and free WiFi. The inn’s 26 rooms feature bonuses like in-room fireplaces, soaking tubs, and modern art that juxtaposes old world patterns. Newly renovated, carbon-neutral, LEED-certified and pet-friendly, Hotel Carlton is a hotel that’s equally eclectic, laid-back and eco-friendly. In the common areas, you can enjoy a wine social hour every evening, and in the rooms, you can enjoy blackout drapery, a marble-topped writing desk, complimentary WiFi, Keurig coffee makers and walk-in closets. A residential hideaway in the hilltops, Hotel Drisco offers a boutique atmosphere inside an elegant 1903 Edwardian building at the top of the Pacific Heights neighborhood. After the completion of renovations in 2017, the hotel boasts even more luxurious amenities and finishes, and it’s all offered alongside hilltop views, complimentary breakfast, daily wine receptions and chauffeur service. Home to Top of the Mark, the penthouse lounge famous for its 360-degree views of the city, it goes without saying that this hotel offers some of the best views in San Francisco. But in addition to the penthouse, all the hotel’s suites and guest rooms face outward to offer even more views. As if that weren’t enough, it also offers grand architecture, luxury amenities and a storied history. Where Do You Stay When You Visit San Francisco?